Devi (Chennai, India) on 18 September 2017 in Plant & Nature and Portfolio. We had been to a butterfly park...but the maximum number of butterflies were to be released here only after fifteen days. Just for a fleeting moment I got one ! Un beau terrain de jeux pour les insectes. it will return, I know! What a beautiful collection of living color . . Anyway, you captured it very nicely ! This is a happy butterfly. Nice. It is hard to get a good shot of these flittery little butterflies. Yes, but you managed to capture it before it flew away Devi. 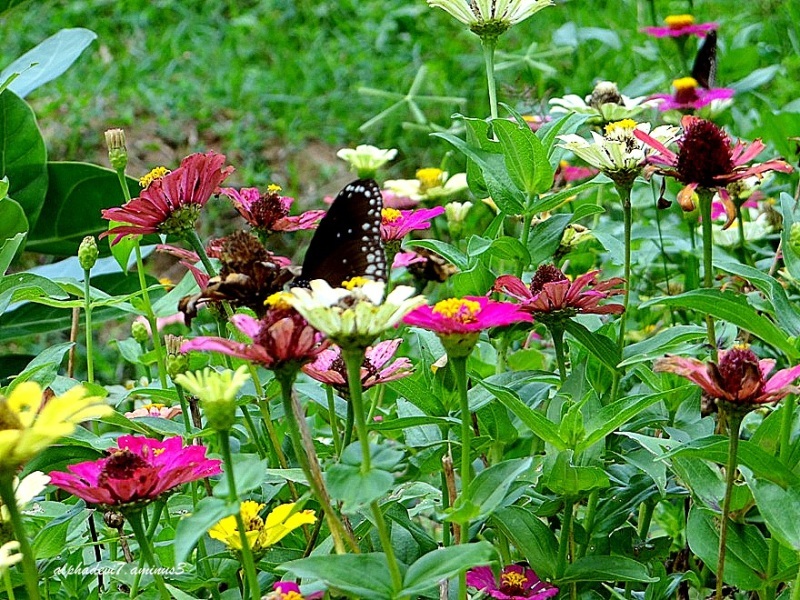 Lovely colorful capture , flowers and butterflies . I like beautiful colors. Wonderful capture. A very good capture of the butterfly. I like the flowers in this picture too. The beautiful creature couldn't resist the lovely flowers. Such a beautiful, colorful garden you've captured here!! This is just beautiful! I love all of the bright colors! A beautiful garden! Beautiful image of the garden and the butterfly. Wonderful colours. Lovely. looks like it was on its way when you snapped the shot! Lots of nice bright blooms surrounding the butterfly.